You know, I started this story three times. Each time, it just got so stinking long! This birth was so much more than a birth. It was a roller coaster of freaking insanity. My husband is a disabled vet medically discharged from the Army. We lost our home to foreclosure. We made the decision after much prayer and counsel to move 2500 miles to start again. We moved when I was 39 weeks pregnant. Also, our van exploded two weeks before we moved. Not a necessary detail, but it's kinda funny now. This was our 6th baby. 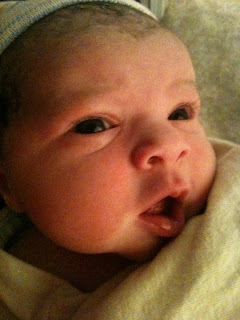 We had decided on an unassisted birth early on, long before we knew we were moving. This was such God's provision. By preparing us for an unassisted birth, it made the move so much less scary. We made it. Not without some mishaps and adventures...but we made it. I didn't birth on the road, didn't explode from water retention, and didn't eat my children. The novelty of moving wore off before we got out of the state of NY, so it was a long drive. I love my kids, I love my kids, I love my kids. That was my mantra, people. Hormones + 5 kids + cramped van = tears. The kids cried too. Anyhoo. We managed to get the truck unloaded and even get our stuff unpacked. In true hilarious sitcom like fashion, I went overdue for the first time in 6 babies. So we ended up with several days to settle and just relax. 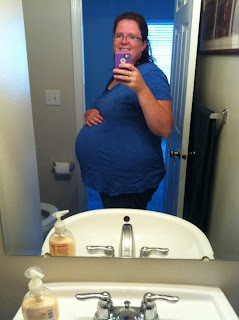 A few days before labor day, contractions had started and took up the typical for me pattern. Annoying at night, and mild during the day. I labor best at night. I am 2 days "overdue". Contractions are getting more consistent and stronger. Baby has also dropped significantly. We decided to get out of the house and keep busy in hopes that it'll keep things going. So we took the kids to Walmart and got the big girls haircuts for school. Then we went to McD's and let the kids play in the Playland while I labored. When I went to the counter to order lunch, I was clearly in labor, because the lady asked me several times if I was ok. LOL. This kept us busy for the day. In the afternoon, my mom arrived and we settled at home. After the kids went to bed, my mom and hubby watched a movie and I chatted with my BFF for a bit. Active labor hit about 9pm. I knew it, because I hit that distinct point where I needed to focus and turn inward. I said goodbye to my friend and went upstairs to labor in the quiet. A few contractions in, my water broke. Hubby came upstairs and put the waterproof mattress on the bed, incase baby was born there, and my mom petered about downstairs. Our toddler woke up and mom took care of her. I labored in the tub for awhile, but I got terribly cold, so I got out. I can see why laboring in water is so nice, but it was awful in a regular tub. It was really hard for me to find a comfortable labor position. Hands and knees wasn't doing it. Swaying wasn't doing it. Sitting or laying on my side wasn't doing it. I wandered aimlessly from the bed to the toilet between contractions. After about 3.5 hours of good, solid, active labor and I was sitting on the toilet between contractions. BAM. She descended. No urge to push, no transition. Just holy-crap-she's-coming-NOW. I'd heard of Fetal Ejection Reflex, but this was the first time it had ever happened to me. Holy heck. Hubby came running and tried gently to coax me off the toilet. I was able to stand up just in time for her to crown. Hubby caught her, and I untwisted her from her cord. FER is no joke. She was born in one contraction. I didn't even push. She just came flying out! Amazing! She pinked right up and let out the sweetest little fuss. I sat down on the bathroom floor (lined with chux pads) and waited for the placenta. After about 15 mins, the placenta came, we cut the cord when it stopped pulsing, and my husband cleaned up the bathroom while my mom held baby and I showered quickly. Baby hadn't yet decided she wanted to nurse yet. She was so content to just be held and discover her new world. After the shower, I ate a bowl of cereal and we went to bed, nursing baby. She nursed all night and I had milk at 6 hours PP. Seriously. In the morning, my kids (who slept through me roaring their sister into the world!) came into our room and were overjoyed to meet their sister! This birth was heavenly. Amazing. Empowering. For both me, and my husband. A perfect end to a summer of craziness! "She was born in one contraction. I didn't even push. She just came flying out! Amazing!" Wow! She's a fighter, eh. And a great comfort too. So cute and adorable photo, btw. Cathy@How Sure Are You With Your Baby Formula Ingredient?